Since 2005 SPW has constructed a creative and productive partnership with the gender program at the Institute of Development Studies (IDS – UK) at the University of Sussex that, at that point in time was initiating a new line of work to more consistently address sexuality and development. This partnership included the participation of Sonia Corrêa, co-chair of SPW, in the seminar Realizing Sexual Rights (September, 2005), of which the content has been published in the IDS Bulletin Sexuality Matters. This publication is being translated into five languages (Arabic, Chinese, French, Portuguese and Spanish) and SPW being responsible for the Portuguese version. We are very pleased to inform that the Portuguese, Arabic and Spanish versions are already available online. 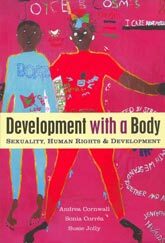 Another relevant partnership to be mentioned was developed in relation to the Seminar on Sexuality, Development and Human Rights, sponsored by the Swedish Minister of Foreign Affairs (April, 2006) that, among other outcomes, resulted in the book Development With a Body, edited by Andrea Cornwall, Sonia Corrêa and Susan Jolly recently published by Zed Books. This book offers compelling insights into contemporary challenges and transformative possibilities of the struggle for sexual rights. In April, 2008, Dorothy Aken’ova, Pinar Ilkkarkan, members of SPW, and Sonia Corrêa have participated in the Sexuality and the Development Industry Workshop (April 3-5, 2008) of which key contents and interviews with participants can be accessed here. Read also the individual summaries.